Home Editorials Where Are The Gamers In The Indian Game Industry? Having been to the Thermaltake launch event here in Calcutta a few days ago and then the Asus #ROGMeetup (which is essentially a launch event and not a meet up at all) yesterday, one thing that a lot of people in the industry think but don’t say out loud is very much apparent. Most of the ‘leaders’ of the Indian game industry aren’t ‘gamers’. I’m not saying that none of the businessy guys haven’t played games but most of the said people do not understand the art, the sense of community or the cultural significance that makes up the gaming industry around the world today as we know it. Most just parrot the word “esports” in hopes of selling their products in the country and bring that forward as their contribution to the game industry in India. They do it mostly because they see the esports hype train that’s been going around the world in all it’s glory and while it’s by no means bad business, they’re concentrating on a tiny niche of a consumer market that is already 10 million people big according to Nvidia India, which they restated to me along with a bunch of other people at their GamerConnect events here in Calcutta. At Thermaltake Launch Event, Kolkata. Picture by TechArx. There is a reason why the game industry in India isn’t going anywhere anytime fast. There are plenty of reasons actually but the most prominent one to me seems to be the lack of leaders who within well known gaming brands present in India who will unite gamers rather than just sell products. And it’s not like the current leaders are particularly good at selling products either. At the #ROGMeet, the machines that were supposed to show off what Asus’ devices were capable of were laggy, didn’t have games installed in them or were running CS:GO. Here’s a pro tip to the suits, if you’re going to show off a high end product, you should showcase a high end software that will actually utilize the horse power that your product can offer. Not something that makes an insignificant dent to your GPU like CS:GO. And at least make sure that the samples you offer to try out at the launch events are representative of what the actual products will look like since there are people who actually try them out in order to see how they perform. Not every gaming journalist in India just looks at them and sees how shiny or pretty the color lights are. Most people who went to the Asus launch event got swept away by the luxury treatment that was given to them. And while I applaud Asus for treating their guests properly, I can’t help but be disappointed at everyone who went to the event and ended up singing nothing but praises about it even though the contents of the event in itself was anything but up to par. No one wanted a CS:GO gimmicky tournament between journalists in the event, nor were we looking forward to doing 1 minute reviews of laptops which weren’t running at their optimal prowess. At #ROGMeet, Delhi. Picture by Gaming Central. But at least Asus had the right idea to bring in gaming bloggers and enthusiasts from around the country who can actually offer their side of the feedback. The Thermaltake launch event that took place in Calcutta was so littered with the word gamer, it made my ears hurt, yet there were only but a few of them in the event. Almost the entirety of the gaming population during the Thermaltake launch event consisted of me and the TechArx crew. The majority of the room was filled with people wearing suits and only a handful of them ever considered the perspective of actual gamers from what I’m aware. Most people who are leading the gaming brands in India today grew up without playing video games and hence they do not truly understand the culture or the industry surrounding them. But things are obviously changing. As we approach a day and age in India where more and more people see video games as something normal rather than something that’s only meant for the enjoyment of 12 year olds and as companies like Asus and Nvidia host gaming events where they invite actual gamers to take in their perspective and feedback, things are looking brighter than before but it should be noted that things in India were never that good to begin with. At Nvidia #GamerConnect in Kolkata, at Fusion Max cafe. 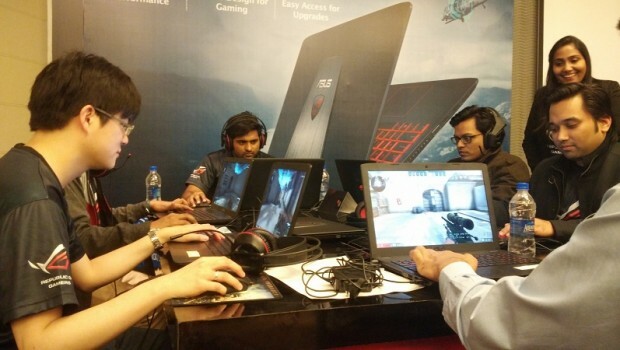 Gaming events in India can be about much more than just product reveals or CS:GO contests between journalists and 12 year olds (Yes, that happened at the Asus #ROGMeet event and it was mildly amusing.) Gaming brands in India need to realize that the industry over here is currently in it’s infancy and if they genuinely want to help the it grow, they need to take into account that there’s more to the industry than esports. A lack of active interaction between gamers and brands leads to the latter making focus groups out of 12 year olds’ and thinking that they’re on the right track because their focus group agrees with whatever is fed to them. Two significant steps have to be taken for gaming industry in India to progress. One is when we start comparing ourselves with the international players and stop comparing ourselves with the competition at home, because let’s face it, competition at home is probably not the best and that’s putting it lightly. The second is something we’re seeing already happen, it’s when brands and gaming companies start taking feedback and perspective of gamers. But while this is already happening to a certain degree, more brands could adapt a similar learning perspective in order to better their own brand’s standing in this country, and in order to better the gaming community and industry as a whole.